Beth from the EarthBox forum shows how an EarthBox and fluorescent lights equals cucumbers in the winter. Critiquing the cost of these cucumbers would miss the point. Beth has learned something valuable about urban food production and has enjoyed the reward of eating fresh cukes in the winter while doing it. Meanwhile, dedicated dirt huggers are probably reading seed catalogs and dreaming about summer or they're on the web lobbying for a dirt garden at their kid's school. When affordable LED lighting is here in the future we will look back with amusement, much like we do now when seeing old photos of kerosene lamps. I well remember them from summer vacations in the country. Lettuce Into Your Living Quarters! Visitors look at the hydroculture lettuce and herbs grown only by LED lamps at a booth of Japanese company Synergytec during the Eco-Products 2009, Eco Style Fair, in Tokyo, Thursday, Dec. 10, 2009. (AP Photo/Shuji Kajiyama) Editorial note: I searched but could not find a website for Synergytec and this system. This setup is so cool. AP captioned the system as hydroculture (a passive method) when in fact it is more accurately a hydroponic system. However, that's beside the point. The significance of this photo for me is that it is set up on an InterMetro type rack just like the racks in the CuGreen plant lab. A big difference is that the lighting is LED while mine is ordinary fluorescent. Fluorescent lighting is adequate for growing and maintaining most indoor plants (i.e. houseplants) but not for growing vegetables. This is a peek into the future of urban greenscaping in city apartments and homes. Bravo! These are the next steps for the recycled pop/soda bottle “SIP salad makers” shown in the portable potting tray. The seeds sprout under fluorescent shop lights hung on one of the shelves of a light garden rack. The clear plastic covers are 16-ounce deli containers that just happen to fit perfectly on top of the 2-liter soda bottle SIPS. The light garden is an InterMetro style rolling rack from Costco (6’h x 4’w x 1 ½’ deep). InterMetro racks and copies are widely available. They are easy to move around and the shelves are adjustable in one-inch increments. The ordinary daylight fluorescent lights are on daily for 16 hours. The next temporary home for the SIP salads is on my fire escape. Some of them will go into 5-gallon utility bucket SIPs. 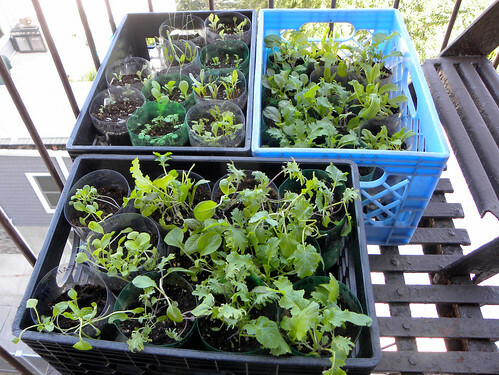 Others, containing basil and other leafy greens will grow on windowsills in the neighborhood including PS 102. Richard Webb, in London, sent me these photos. He is obviously a creative and handy Brit and I thank him for sharing his work so openly. He calls his growing cabinet a "salad bar". Good name! I might have written the caption as "Belly Right Up to the Salad Bar" but what many of us are trying to do is reduce our bellies. So, maybe we should say "Step Right Up to the Belly-Shrinking Salad Bar". 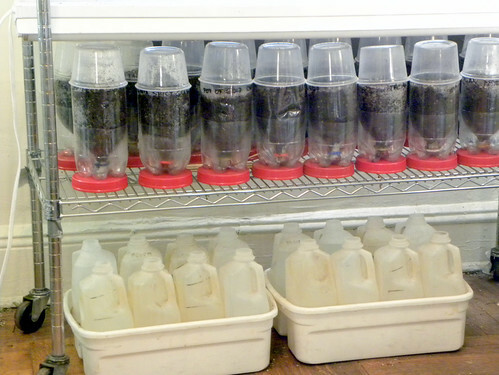 Note that there are sub-irrigation plastic bottle planters inside the cabinet. There will be a separate post about them. There are hundreds of thousands (or millions) of city dwellers that could use something like this in the dead of winter (or all year round for that matter). Potential sources of plant cabinets are IKEA, thrift and second hand stores. Consider armoires, wardrobes and other cabinets. There is much room for creativity here with great potential for a healthy reward.